1 strawberry flavor Special K bar (90 calories), and 6 oz. 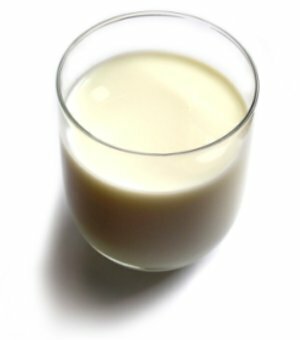 of skim milk (60 calories). In a rush to dry my hair and leave for work haha I'm always late. The milk was kind of unpleasant though, I left it in an open cup in my fridge yesterday and it absorbed some pretty funky fridge smells. I had to just try my best not to smell it while drinking it. I'm sure it was still fine to drink, but next time I'll know better when I put it in my fridge. Rest of the leftover mushroom ravioli (5 ravioli + 3 oz. grilled chicken breast, 560 calories). Doesn't taste as fresh the second time around, especially since it was microwaved, but still a tasty lunch that saves me money and effort instead of getting it from elsewhere. It made me pretty sleepy when I went to my class afterwards though, I'm not sure whether it's the food or the fact that I slept 4 hours last night. 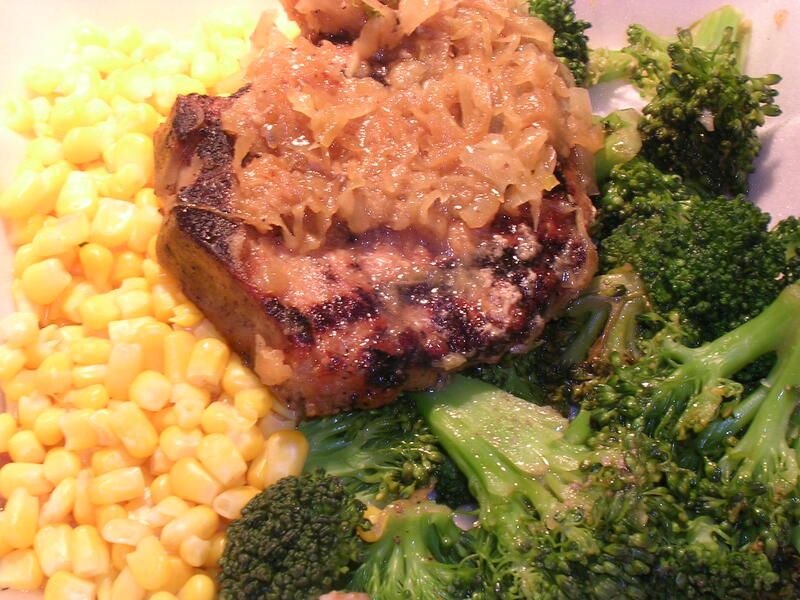 Rest of the pork chops and veggies (285 calories). So I'm not sure where I stand with this split dinner thing. On the one hand, I feel decently satiated right now, and it's later in the evening, so that's a good thing. But earlier when I had just eaten the first half, I felt kind of robbed, because I didn't feel full and satisfied like I normally do. Admittedly, it's less than 300 calories at a sitting, so maybe my stomach is smart enough to tell the difference. Still, it was a little frustrating to have this funny gut feeling that you're going to get hungry later and you should eat more! I'll give this another go tomorrow probably, but I might end up tossing out the idea and just continue to sub in a healthy snack later on. It's also a little bit boring to eat the same exact thing twice within a time span of a few hours haha. 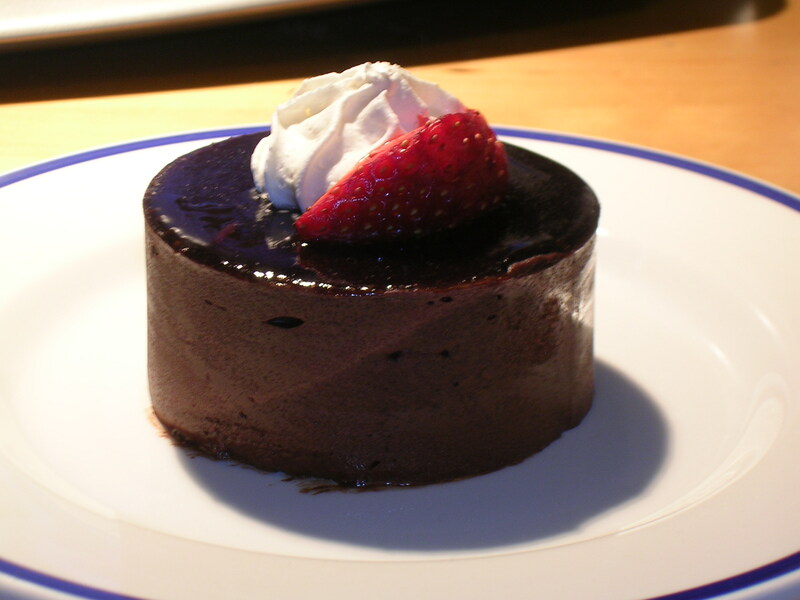 1/4 of chocoate mousse torte (~100 calories). Haha I couldn't resist trying a portion of the dessert because I didn't want to miss out on it when its still fresh. Mmm so yummy and look how pretty it is! I looked up the nutrition for it online, but it was hard to find because it's a catered type dessert. My best guess is that it falls between 200-500 calories, so that's why I only ate 1/4 to make sure I didn't accidentally overindulge. 1/4 is a really small piece, maybe like three quarters of a cubic inch… but it was decadent nonetheless. The outside is covered with a layer of dense chocolate mousse, which means that the cocoa content in the chocolate is high. The inside is a torte styled layering of syrup soaked cake and chocolate mousse. Think tiramisu, except exchange the marscapone with the mousse. And thank god for this blog, or else I probably would have eaten the whole thing without giving it a second thought. Now that I've split it up into 4 pieces, I'll have three more times when I can eat it haha. Total comes to about 1400 calories today. I went to a fitness calculator to figure out how many calories I should eat to maintain weight, and it said about 1780 calories a day if I don't actively exercise. So hopefully my current undercutting of the daily caloric intake should be good for me. It said that women should never go below 1200 calories a day, which I've been surpassing every day, so that's not a problem. Okay that's all, until tomorrow folks! This entry was posted on Monday, March 12th, 2007 at 6:28 pm	and posted in beverages, desserts, Italian, pork, rice and pastas, snacks, Uncategorized, vegetarian. You can follow any responses to this entry through the RSS 2.0 feed.